With Our Aloha Hawaiian flowers and gifts announces special tropical assortments on sale for Easter and spring. As winter continues to embrace the US mainland in Hawaii spring tropical flowers are in full bloom. Just in time for the upcoming Easter holiday, With Our Aloha Hawaiian flowers and gifts has prepared seasonal specials for immediate shipment to any US state by FedEx. Offerings include tropical flower assortments, protea baskets and Hawaiian orchid corsages for Easter Sunday. The premier tropical flower assortment this Easter season is 'Sensational Spring' which features king protea and pincushions from Maui, tropic fleur heliconia and soft pink anthuriums. This assortment is offered in 6, 12 and 24 stems with added greenery. For the month of March the 6 stem assortment is on sale at $49.90 plus shipping. Exotic protea are also in full season in upcountry Maui. 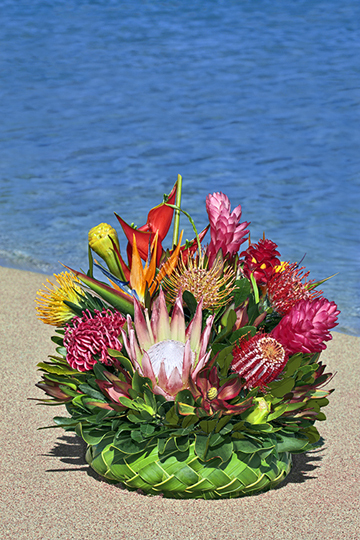 With Our Aloha offers a special arrangement of seasonal protea in a woven palm frond basket. Both the flowers and the basket can be dried and kept as a remembrance. This seventeen stem assortment comes with free shipping by 2 day FedEx. Since 2000 With Our Aloha Hawaiian flowers and gifts has provided fresh cut Hawaiian flowers, hand made orchid leis, blooming orchids and gift baskets sent to all 50 US states. All flowers are sent directly from farms on the Big Island and Maui.